Miniature Schnauzers etc. : Shazzam Of Oz Whatever "Vanya" at the show ring. 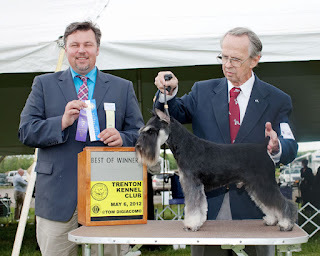 Our good friends - Carol and Ron Meitzler again did a great job of showing one of our beloved schnauzers. This time it is Vanya, our young mini, full brother and litter-mate to beautiful Sammy, who just was finished last fall and had her puppies at Christmas night. We were very pleased with Vanya's first show picture and I had to get it and share it with all our friends. To make whole story even better, this weekend we found out that one of Vanya's puppies (from his very first Sired litter! ), just got two majors and Group 4 and if everything goes smooth, soon our boy to be an official Champion Producer. I like it even better then idea that he will become a Champion... any breeding dog is just as good as puppies he/she is producing. But he is pretty boy and I think he also will get his title soon and then be back home with his Mommy. Proud of him. Carol and Ron - thank You so much for all Your help and support.